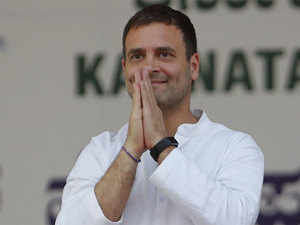 Pune: Congress president Rahul GandhiFriday said his party’s manifesto was an expression of the people of India and ruled out burdening the middle class to fund the anti-poverty scheme Nyunatam Aay Yojana (Nyay). “The manifesto has been prepared after consultations with all stakeholders. The middle class will not be taxed and income tax will not be increased to implement the Nyay schemewhere Rs 72,000 will be deposited in bank accounts of poor people every year if the party is voted to power,” he said. The Congress leader said he was against politicisation of the air strike. “I feel uncomfortable that the PM does that. But it is his choice,” Gandhi said. “In the end you have to face it. I live in reality. Violence doesn’t benefit anyone. It gives only false sense of confidence,” he said.